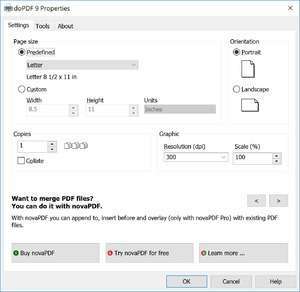 doPDF is perhaps one of the most handy PDF creating utilities and what's even better: it's distributed under a freeware license. With doPDF, you can create PDF files from virtually any Windows application which can print documents. It works as a printer and in fact, creates the PDF files from what you computer spools. After printing, or rather doPDFing the document, you will be automatically redirected to the PDF file and it will be opened with whatever your default PDF viewer is. Version 10.1.111 is a freeware program which does not have restrictions and it's free so it doesn't cost anything. For security reasons, you should also check out the doPDF download at LO4D.com which includes virus and malware tests. Additional screenshots of this application download may be available, too. doPDF download been highly rated by our users.